The following is a story about PRIDE in Arizona. It is about a man by the name of Allen Allcott. He has been with the Ak-Chin Fire Department since 1994. He moved up the ranks from Firefighter/EMT to become a paramedic and Captain. He is known throughout the community for his generosity, compassion and for his commitment. The department receives cards, letters, and yes, even pizza, homemade cookies and cakes from grateful citizens who have been helped by Allen in their times of need . victims were on the ground by the vehicle. The car was burning and had started a brush fire in the field alongside the road. Only one Deputy was on the scene when Captain Allcott arrived. The officer had just spotted one of the injured passengers lying in the adjacent field, with his clothing beginning to catch on fire. 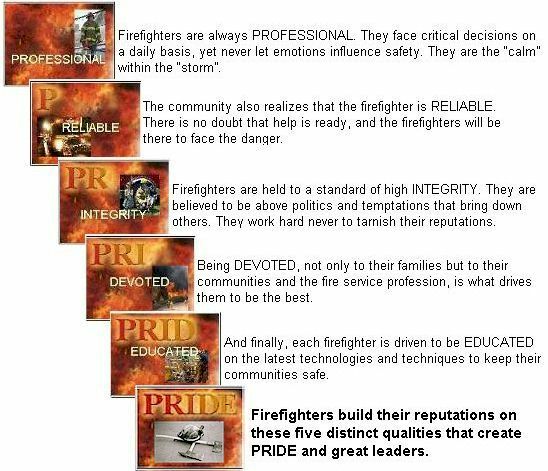 Allen made a split second decision that was based strictly on the professionalism of being a firefighter. Without protective clothing or regard for his own safety, he stomped out a 100-ft. path through the burning grass to get to the victim. Allen quickly smothered the fire on the unconscious man’s clothing with an old pair of work gloves he had instinctively taken from his truck. The fire continued to grow and was now burning all around the two men. The path Allen had created to reach the victim had re-ignited and was burning again. Allen knew he had to make another rapid decision. His fire crew arrived on scene just in time to watch Captain Allcott clearing a path, fighting his way through the brush fire while dragging the unconscious man to safety. In total there were three victims between the ages of 18 and 20. With the help of his department, the fires were quickly contained and the patients were all airlifted to a nearby hospital. 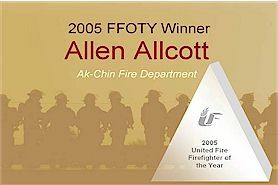 Afterwards Allen was asked why he risked his own life and he explained, “I just couldn’t sit there and watch the young man burn”, a candid remark that so clearly illustrated his dedication and compassion as an Arizona firefighter. Now that’s a story of PRIDE! 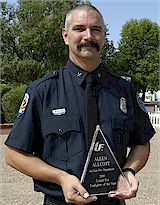 We are pleased to present Captain Allen Allcott with the Symbol of Excellence Award as the 2005 United Fire Firefighter of the Year! Allen would like to give special thanks to his wife and his mother for their faithful support.